The NFL offseason has barely started, and yet the Cleveland Browns have just about guaranteed that no team's will be worse than theirs. Multiple league sources have told NEOMG that Farmer was the high-ranking personnel member who violated the NFL's electronic use policy by the impermissible texting. Those messages were then apparently relayed to the coaches. The NFL investigated the improper texts, and are prepared to announce sanctions within the next couple of weeks. A resolution could come as early as this week, but probably no later than three weeks. Farmer is facing a multigame suspension — as many as three or four games — and the Browns are facing the loss of a draft pick if the probe, conducted by in-house NFL executives, shows that Farmer acted improperly. Not only is this one of the dumbest ways to go about losing a draft pick—if you're going to cheat, at least cheat big! I can't imagine Farmer texting "hey i was thinkin' maybe we shud run the ball more ;)" to the sidelines helped the Browns win any games—it also reportedly helped drive away offensive coordinator Kyle Shanahan, who managed to wriggle out of his contract after the season was over and was immediately scooped up by the Falcons. That assessment washes pretty well with what Haslam has done in Cleveland since taking over ownership of the team in 2012. He cleaned house when he first arrived, ridding himself of GM Tom Heckert, head coach Pat Shurmur, and team president Mike Holmgren, only to end up cleaning out his own hand-picked regime a year later. Head coach Rod Chudzinski lasted just one season, as did front-office duo Mike Lombardi and Joe Banner. According to La Canfora, current team president Alec Scheiner and GM Ray Farmer spent this season meddling with head coach Mike Pettine, even going so far as to meet with him at 6:00 a.m. every Monday to watch film. 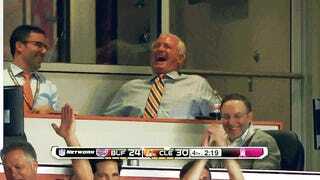 And then there's Haslam's meddling. He was the driving force behind the Johnny Manziel draft pick, and La Canfora reports that he also blocked a Josh Gordon trade that would have netted the team a second-round pick in 2013. Now, Haslam is reportedly plotting to trade up in this year's draft so that he can take Marcus Mariota. The sad thing is, that might not even be the worst idea. With Manziel not looking like anything close to an NFL quarterback and Brian Hoyer sure to walk in free agency, the Browns' best option at quarterback right now is Connor Shaw. Mariota developing into a solid NFL quarterback as a member of the Browns would be a fitting flourish for Haslam to put on his first few years in charge: assholes like him are always the most insufferable when they are occasionally right.